An Internet Connection is all the infrastructure you need to access iMS and DMS. The Xplair Platform provides a cost-effective solution that enables you to leverage our applications without the need for in-house IT staff or systems. Software as a service (or SaaS) is a way of delivering applications over the Internet—as a service. Instead of installing and maintaining software, you simply access it via the Internet, freeing yourself from complex software and hardware management. Our software is flexible enough to accommodate the unique work-flow and needs of your organization. And, we understand the unique landscape of the market and specialize in helping companies increase ROI from the analysis and surveillance capabilities provided within our products. Our primary web-based system is the illumair Management System (iMS). This is an exciting, effective, easy-to-use portfolio management and surveillance technology. This system fills a long-time gap in the marketplace—customers get access to charting, graphing and other tools that provide transparency into their active & liquidated portfolio. On-line tasking and workflow is also a component, which puts access to the people managing the assets in real-time. With this technology, decisions no longer need to take weeks of data aggregation and research. The information is all right there, across the portfolio and available on-line 24/7. Informed decisions may now be made in minutes. iMS is a web-based portal intuitively designed to link investor and service provider through a system of comparative analytics, risk metrics, interactive charting, and workflow user-tasking. The interface enables service provider-to-investor transparency and provides for actionable full-duplex dialogue between all users. iMS maps 300+ asset level characteristics from multiple servicers, allowing loan investors and other stakeholders (insurers, agencies) to view their collective portfolio irrespective of who services the loan. Clients using multiple servicers can efficiently manage them all in one location by using iMS. 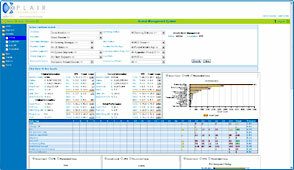 Loan and property-level data is then aggregated along relevant performance metrics and trend analytics to help investors and stakeholders to better view: Risk - by segmenting and tracking the portfolio along dozens of dimensions; Champion/Challenger - view performance from acquisition expectations by vendor; Performance - by segment, vendor, or both. Another offering of xplair is the Deal Management System (DMS). Another web-based system that gives users the ability to open and manage new deals—demographics and values are classified instantaneously. Deals are managed through funding and then measured and tracked against many performance metrics. Because considerable coordination is necessary to ensure maximum effectiveness, DMS provides a web-based workflow engine that was designed to create a partnership between acquisition, servicing, asset management and capital markets. During acquisition and due diligence, DMS allows asset managers and underwriters to order the requisite due diligence products from vendors, consolidate and score the results, track and report the status and performance of assets as they board with internal and/or external service providers. In short, DMS is a centralized portal where asset managers can task, follow-up, and report on activity necessary for successful resolution across multiple service providers in near real-time. As an acquisition tool, DMS can accept and normalize asset level mortgage information (from a myriad of financial institutions) in a secure environment, enabling efficient risk-based pricing. The specific bidding assumptions (cost of capital, return, exit strategies, etc) used in asset valuation/pricing, are easily modified and subject to the will, discretion, and goals of the potential buyer. DMS allows buyers and sellers to post, track, and communicate with the capital markets (bidding) functions. DMS provides the necessary resources that make bidding and due diligence much more streamlined and efficient. If you would like a one-on-one personalized demonstration from one of our account executives, please contact us. Copyright © 2019 xplair Technology LLC.